It might sound wildly futuristic to be talking about flying cars, electric planes and a driverless racing car capable of speeds of up to 200mph, but these and many other fantastic new technological concepts will be on display at our super new FOS Future Lab feature from June 29th to July 2nd. The 200,000 plus visitors to the sell-out Goodwood event will be able to interact with a stunning showcase of what the future of transport might be like, alongside cutting-edge technologies used beyond the automotive world. The exhibit positions the Festival, which has become known as the new British Motor Show, firmly at the heart of discussions on the future of travel and technological innovation. The star of the show is ROBOCAR– the world’s first driverless electric racing car, designed by Daniel Simon (Tron: Legacy, Oblivion, Captain America). 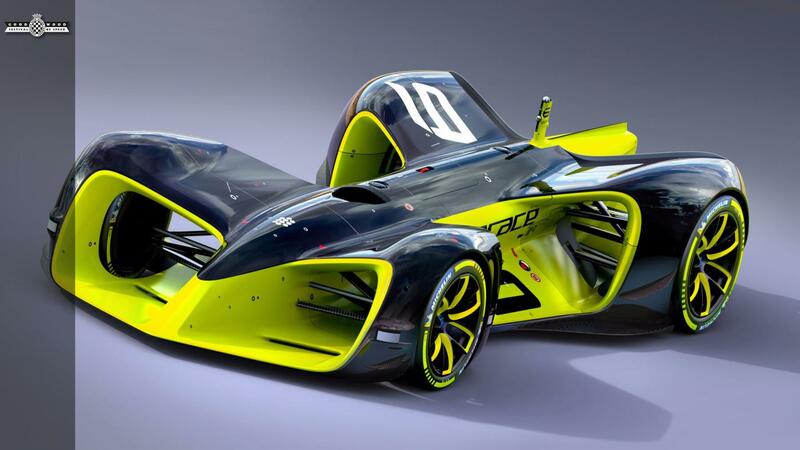 These astonishingly beautiful cars are designed to take part in ROBORACE, a motorsport championship for autonomously driving, electrically powered vehicles on Formula E circuit. Fast and sleek, there is no space for driver to sit anywhere, which is mind-blowing to see in action. The technology behind making these cars work on the track is a story in itself. Alongside will be exhibits from the future of flight, with Flying cars from NeoXCraft, a British designed product, engineered and built (Derby) by VRCO. This concept is for a future private, luxury flying road vehicle, in the quadcopter style. It is a leading example of the hot topic of VTOL (vertical take-off and landing) craft, which are strongly influencing the future of private land-to-air transport solutions today. PAL-V ONE (Personal Air and Land Vehicle), a vehicle design which combines a gyrocopter with tricycle undercarriage (already available to order) will also be on display alongside Solar and supersonic planes from Boom Supersonic. Boom Technology is making a supersonic airliner faster than Concorde, yet so efficient tickets will be affordable to the average airplane passenger. The plane will fly at a speed of 2.2 Mach – so has the potential to take you from New York to London in 3hrs15minutes. A new 8ft model of the passenger craft will be on show with a VR experience so visitors can ‘walk through’ the future plane interior. Solar Impulse 2 made history after completing the first round-the-world flight by a solar-powered aeroplane, last July. A 4.8 wing-span model of the aircraft will be exhibited at FoS. The Extra 330LE is a record-breaking electric plane holding two performance world records – fastest speed for an electric plane and fastest climb (3,000 metres in 4m22s). Powered by a Siemens motor, itself a record-breaker for power-to-weight ratio. Plus there will be so much more for visitors to interact with and experience including HTC Vive x BBC Space Walk– the award winning VR experience commissioned by the BBC that allows you to float around outside the International Space Station (ISS); HTC Vive x Tilt Brush– a three-dimensional drawing tool, in VR, which allows the user to draw in beams of light within the app environment and Stratasys – 3D printing experts who will be staging a live project where globally-renowned sculptor, Nick Ervinck, will be ‘reimagining’ the Goodwood trophy during the event, using these exceptional technologies.